March 6, 2018 07:59 / 16 Comments on Is NAFTA a ‘Bad Deal’ for America? 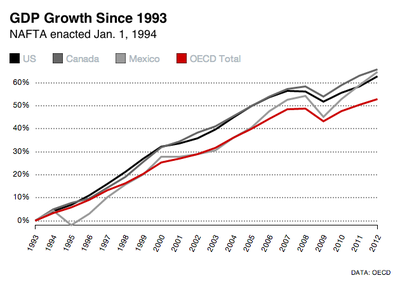 GDP growth in NAFTA countries since 1993 – NAFTA enacted January 1, 1994. OECD. But some American Congressmen and Senators were nervous on account of the many U.S. job losses since 1974 and were concerned that even NAFTA could go wrong. And let’s face it, some members created a negative stir so that new U.S. president Bill Clinton would feel compelled to direct more federal funding to their districts in case NAFTA failed.